Since we're working on a few other projects, we haven't worked on Stack2Blog in a while. We still think it can be useful, especially with the rise of platforms like Posterous, which make blogging much simpler. That said, if anyone else is interested in taking over the project, let me know (edanm@btlms.com). The source is already open-sourced, so taking over the project == us giving you the domain name + (small) db. Drop me an email if you're interested. Updated to work with the 1.0 api (hacked PyStack since there isn't an updated version yet). We've released the source code under the MIT license. Check out the code section below. Stack2Blog (Dead link) now supports all the trilogy sites, not just Stack Overflow. If you like this application, we'd love your feedback on how we're doing. Please check out our site (Dead link) and give us any feedback you can. Have you ever written a long, detailed answer on StackOverflow, and wanted to publish it on your blog/website? If you're like most longtime users, you probably have many great answers scattered all over the place, with no way to manage them. 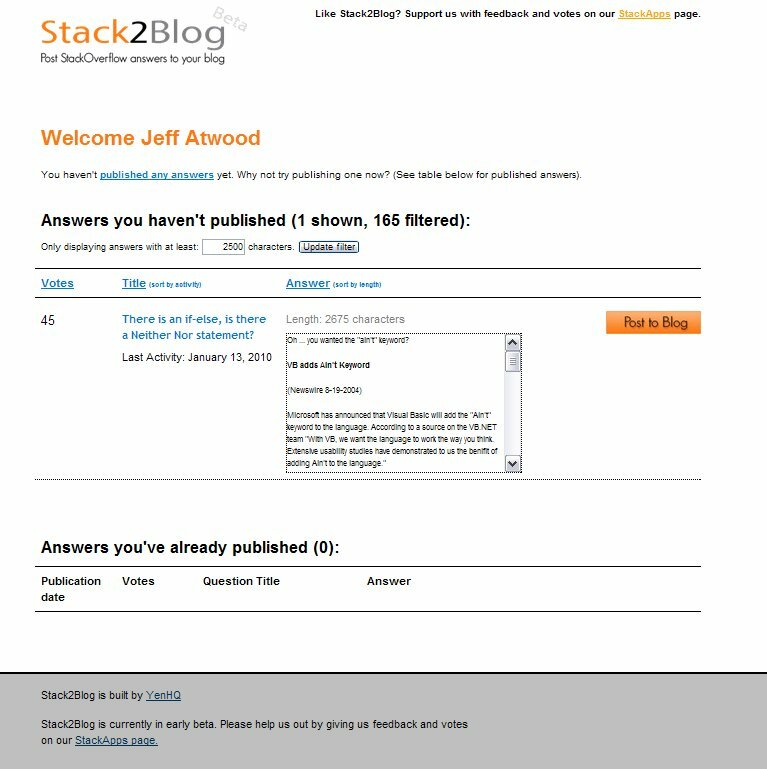 Stack2Blog is a web service that helps you manage which of your StackOverflow answers you've migrated into blog posts and other places. Visit the homepage, enter your Stack Overflow user id, and you'll be presented with a list of all your Stack Overflow answers. You can then copy the answer (formatted for easy WordPress pasting), and we'll remember that this answer has already been copied to your blog. If you like this app, please support us by upvoting. If you have any ideas for features you'd like to see, please post them below. Stack2Blog is in beta stage. Please help us by trying it out and letting us know what you think. Any and all feature requests/bug reports/criticisms are welcome (post them as answers on this page). The source-code will soon be released under an open-source license. This app is being written by Edan Maor and Yuval Cohen. Visit Edan's blog, LoopyCode (Dead link), or follow him on twitter here. Follow Yuval on twitter here. This app is written in Python/Django. It uses Django 1.1. It uses the great Py-StackExchange wrapper to access the StackApps api. The code is licensed under the MIT license, and you can find it on our BitBucket page. Enjoy! For some answers, the answer doesn't make a lot of sense without the question, so having the option to include a part of the question would be great (at least displaying the text in the page so the poster can select what's relevant). Would you like an answer's comments to also appear within the blog post's draft? Would you like these comments replicated as comments of the blog post? Or are they best left unused in the blog post as they have no place there? Let me know your preferences. a really useful and excellent idea, thank you! Love the idea but I get these errors everytime. Please contact the server administrator, webmaster@stack2blog.com and inform them of the time the error occurred, and anything you might have done that may have caused the error. Not the answer you're looking for? Browse other questions tagged app website python obsolete . StackTack WordPress Plugin - Embed Stack Exchange Questions in Your Blog.